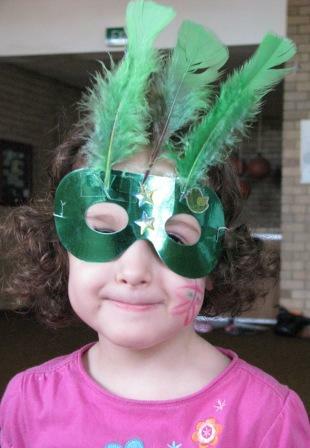 Last year our Shabbat Tot group made greggers for Purim. This year I was torn between doing a mask or a collage – so in the end I combined the two! 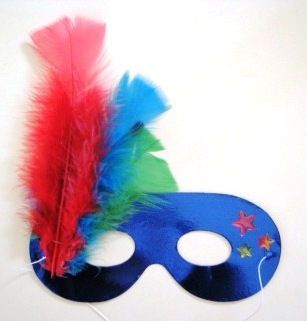 The decorated mask is displayed by hooking it over a tongue cut into the cardboard. Here’s the mask. 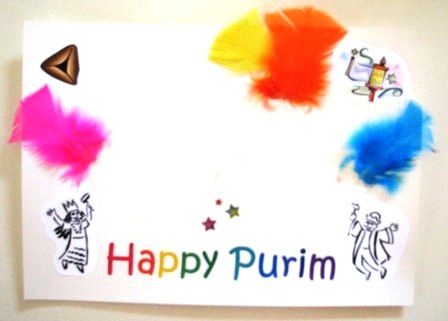 It’s just a simple coloured cardboard shape with a bit of elastic, purchased from the party supplies section of our supermarket, and decorated with coloured feathers and stickers. (You can use whatever craft materials you have to hand). 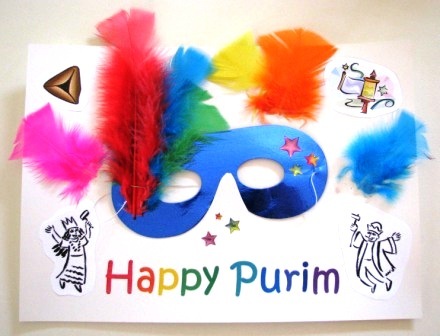 And here is the background – I printed the words “Happy Purim” onto white card, then printed various Purim-themed clip art onto regular paper. 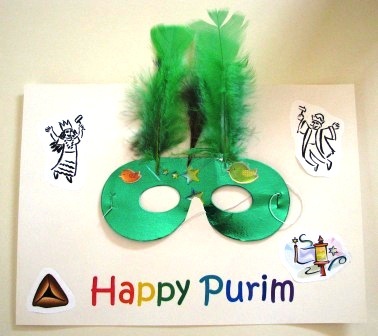 (If you don’t have time to put these together yourself, please feel free to use mine: Purim mask background.) Cut the clip art out yourself or let the kids loose with the scissors and glue. I also put feathers and stickers onto my picture, because my inner child loves coloured feathers – maybe I was a party chicken in a previous lifetime? 😉 Leave space in the middle for the mask, and cut a small hill/bell curve shape with a craft knife to act as a sort of paper nose for the mask to sit on. She hasn’t quite mastered the art of wearing a mask and still being able to see where she’s going, but never mind! No prizes for guessing her favourite colour is green.